With thousands expected to flock to Governor Joseph F. Flores Memorial (Ypao Beach) Park, the Guam Visitors Bureau (GVB) would like to announce parking locations for the upcoming MBC Music K-Pop Concert on Guam on December 1, 2018. The largest K-Pop concert in the region will be headlined by global K-Pop sensation Twice, with performances from Supernova, JBJ95, Elris and Mighty Mouth. Event parking and free shuttle services are available at the JFK High School Lot, the Oka Lot (across from Oka Pay-Less) and the Pleasure Island Tumon Central Air Terminal (T-CAT). GVB encourages concert attendees to carpool and allow additional time to park and ride the shuttle service to the event. Shuttles will begin running from 3:00 p.m. until 10:00 p.m. The last shuttle back to the lots will be at 10:30 p.m. There will be no general parking available at the Gov. Joseph F. Flores Memorial (Ypao Beach) Park. However, ADA Parking will be located on the south side of the park near the Hilton. The concert gates open at 4 p.m. with the concert happening from 6 p.m. to 9 p.m. DJ Oz will be spinning tunes to warm up the crowd starting at 4:00 p.m. International award winning groups InetnonGefpa’go and Skip Entertainment will be opening the concert with performances at 6:00 p.m., with the K-Pop concert beginning at 7:00 p.m. MBC, Korea’s top entertainment network, will be filming the concert for a 90-minute made-for-tv show that will be broadcast to millions of viewers across Asia and throughout the world through MBC’s networks before the end of the year. Food and drink vendors will also be on-site. Vendors include Grid Corporation, California Pizza Kitchen, Beachin Shrimp, Ban Thai, Lyn’s BBQ Stixx, G&G’s BBQ, Sip n Dip, A&L Foods, Sticky Fingers, Island Kraves, Korned. Concert goers can also enjoy sponsor and merchandise vendors — Ongoing Enterprises, Bank of Guam, Smart Town, ABC Stores, and IT&E — will offer fun activities and novelty items for the entire family.. An activities tent will feature mascots and characters from Loconut Entertainment and face painting services by Fundforte. Additionally, a small delegation from Boryeoung city in South Korea will be at the concert grounds to promote its Mud Festival, which is centered on sea mud that is said to have anti-aging properties and minerals for skincare. GVB and Boryeoung City recently signed a cultural exchange Memorandum of Understanding (MOU) agreement to cross promote events in both regions. GVB is working with the Guam Police Department (GPD), Guam Fire Department (GFD), Visitor Safety Officers (VSOs), and other safety security personnel to keep the concert grounds safe. The safety team will work to ensure rules and regulations for the free concert event are followed, which can be found on the official K-Pop Concert site at kpop.visitguam.com. Attendees are asked to bring their printed tickets or have their QR codes ready at the main entrance and baggage check of the concert grounds. 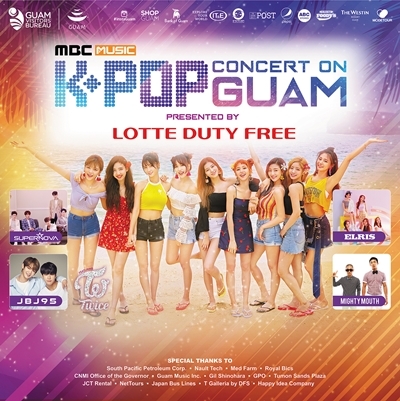 The MBC Music K-Pop Concert on Guam is presented by Lotte Duty Free. The event is also sponsored by Bank of Guam, IT&E, Grid Corporation, The Guam Daily Post, Pepsi Guam, ABC stores, Foody’s Guam, The Westin Resort Guam, and Modetour. Special thanks is given to South Pacific Petroleum Corporation, Nault Tech, Med Farm, Royal Bics, CNMI Office of the Governor, Guam Music Inc., Gil Shinohara, Guam Premier Outlets, Tumon Sands Plaza, JCT Rental, NetTours, Japan Bus Lines, T Galleria by DFS, and Happy Idea Company.